« RV Hot Skin – Condition Causes Death of a Young Boy! 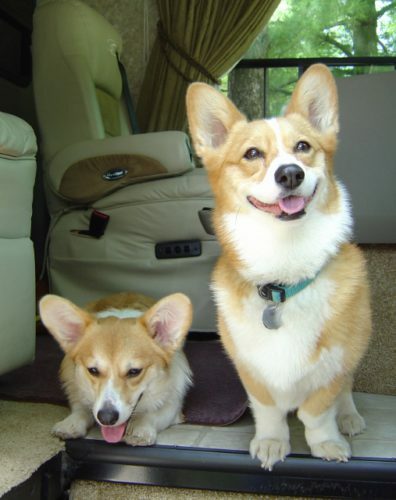 RV travel with pets allows you to take your beloved family member along with you! Not having to put them in a boarding facility where they may pick up diseases, not to mention bad habits, is a good reason to bring them along. But, this takes a little preparedness so that when you hop aboard to hit the road, you have everything needed to make your dog welcome where ever you may stay. It does not matter whether you RV is a travel trailer or a motorcoach; the same campground pet rules apply. For RV travel with pets to be enjoyable, the most important thing to remember is that not everyone appreciates pets, nor wants to have them running around their RV site leaving a “special package” that may not be picked up by the owner. Remember that how you travel with your pet will determine if RV parks will continue to allow pets. So what can you do to be sure traveling with pets continues to be something we can continue to enjoy? When you book your RV site be sure to notify the RV park that you have a pet and that you would prefer to be near the doggy area and among other pet owners. That way you are not offending anyone by having to walk a long way to the pet area and have your dog relieve himself on some non-dog owners site. These folks don’t understand and get very upset. They usually complain to park management and make it more difficult for park owners to consider continuing to allowing pets. Be sure your pet is vaccinated for the area you may be going to. If traveling a long distance from home, the necessary vaccines may be different than at home, depending on what region of the country you are in. We recently traveled 1,100 miles north of our current location and did not think about ticks in the area we visited. It was a big problem for local pets, and we had to be very careful with our dog to be sure she did not pick up a tick! When parked at your site, don’t leave your dog outside and unattended to bark at passers by. If you are leaving the park, be sure to take the dog with you, unless he can be quiet in the RV without barking the whole time you are gone. We have found our furry kids like their soft dog crates during travel, and when we are not taking them along on a short trip away from the RV, they are happy to stay in them while we are gone. Be sure to exercise your dog so that they don’t become bored and become destructive. When walking around designated areas of the park, be sure to carry bags to pick up after your dog. There are many other minor aspects to traveling with pets, but these are some of the major issues that offend RV park owners and other campers. Pam and I have been enjoying the full time RV living lifestyle with our pets for years. Also, as workcampers, we have worked with management in the different parks we stayed at. Pet issues are becoming a big problem. Only diligence by RVing pet owners will keep RV parks continuing to have a “pets allowed” policy. Please feel free to leave a comment if you agree with this post! Taking our furry child with us is one consideration for us. We prefer to have him with us than in a kennel. I agree too many dog owners are not responsible in picking up the packages their pets leave. Shame on them. How about National parks, are they pet friendly? That is one of our big items on our list of places to go. So far we have greatly enjoyed your videos and articles. We have not completed the purchase of an RV yet but are doing our homework. Our purchase will be a toy hauler for our motorcycle. Blessings to your in your travels. Thanks for stopping by our website! We are glad you found our information useful as you investigate the RV lifestyle. National Parks are pet-friendly as long as you adhere to there rules: keep on a leash, don’t harass the wildlife and pick up after them, they are welcome. Best wishes for your RV search. Keep us posted on your progress and check in when you hit the road! Your recommendation to notify your RV site that you have a pet ahead of time to ensure you can be in an area that can allow you to take them out to use the bathroom or run around would be useful. Contacting them before booking the RV site could also give you the chance to ask questions and talk about your stay. This could ensure you understand the rules and can help you find one that will help you get a comfortable stay for your entire family, including your pets.